by the staff of VideoGames & Computer Entertainment Magazine. ,” which ran for four volumes, plus a “Best of” edition. Each of these books was fun to flip through, and in some ways crucial for those wanting to more thoroughly experience certain games, offering such tidbits as data, tips, tricks, strategies, reviews, and/or game storylines. Nowadays, with the prevalence of the Internet, these types of books, while fun to collect, are less important to own for NES fans as you can find similar information online. As such, anyone wanting to write a book about the NES would do wise to produce a tome that provides a different experience than what you can find on your computer. With The Complete NES: Officially Licensed USReleases, Jeffrey Wittenhagen has done just that. 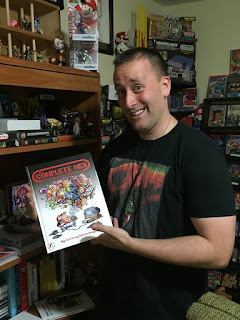 He’s published a large, durable, hardcover, coffee-table style book that is essentially a fancy checklist for collecting NES carts, boxes, and manuals. , the book begins with the “number title” games (10-Yard Fight, 8 eyes, etc.) and continues alphabetically, listing 677 games in order. Each page features three games, and each game title is accompanied by release year, developer, and publisher, plus a full-color screenshot and box scan. The scans can appear slightly fuzzy, betraying the self-published nature of the project, but it’s a nice looking book overall. Each game listing also has a convenient trio of squares for checking off the cart, box, and manual that you own. There are no cartridge or manual scans, and no genre or programmer info, but these are not deal-breaking omissions. What may be a deal-breaker for some is the text, which weighs in at around three to four sentences per game. While a single paragraph isn’t enough to describe and review a game thoroughly, it should be enough to give you a general idea of what the game is about. In too many instances, this is not the case with this book. Aliens have arrived on Earth and they definitely don’t come in peace. It’s your job, as Bill or Lance, to have them leaving in pieces. Through thick humid jungles, frigid mountainsides and slimy caves, the alien horde will confront you every step of the way. The fate of the entire human race is in your hands! is a side-scrolling platform shooter, much less understand its place in history. Overall, The Complete NES: Officially Licensed US Releases is a nifty addition to anyone’s game room library, and it makes for one hell of a checklist, but don’t expect much in-depth or insightful text.